Eight and a half years after it and its sisters arrived in Lansdale, the last operating former Conrail C39-8 is being put out to pasture. 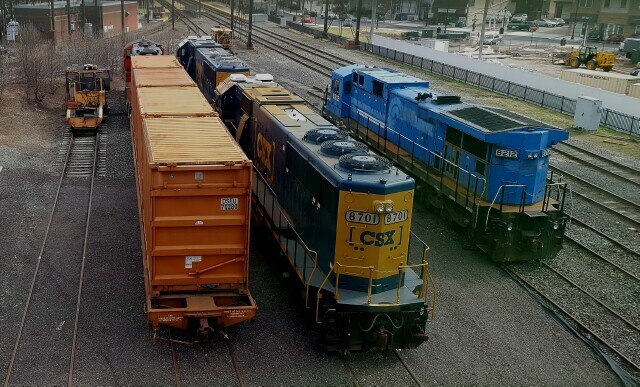 When it first appeared back in October of 2010, PN 8212 was old, used and abused, wearing its original owner's paint (Conrail) and its most recent owner's number (Norfolk Southern) but third party's reporting marks (NSSX - National Salvage and Service Corporation). It would spend its remaining time working for Pennsylvania Northeastern Railroad out of Lansdale and New Hope and Ivyland Railroad out of Warminster, and over the years it has been a bystander during a derailment and even pitched in to clear the SEPTA lines following a snow storm in 2016. Having fallen out of favor with the crews of the PN day job L160, it has most recently been working the night shift with W230, servicing the Doylestown Branch as it did on March 20, here at 9th Street Station in Lansdale. W230 often runs out to Warminster, as it was poised to do on March 27 as it waited for its window at Lansdale Station..
On March 29, it posed in front of the new apartments in Lansdale, but it was separate and apart from the other engines, not a good sign. On March 30, it had been moved to the end of Station Track 1, along side its recently arrived replacements. And now, sitting along side the new kids in town and, ironically, the trash, it awaits its fate.